The age specific fertility rate* among women 15 to 19 and 20 to 24 years of age decreased by 23% and 21% respectively between 2003 and 2013. On the other hand between 2003 and 2013, the age specific fertility rate increased among women 30 to 34 years of age by 14%, among women 35 to 39 years of age by 39% and among those 40 to 44 years of age by 65%. 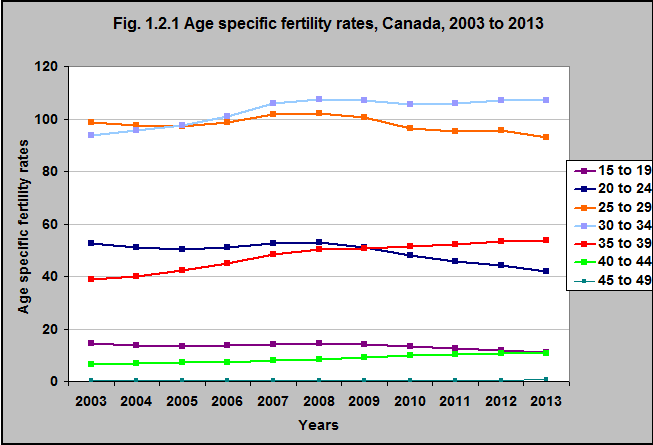 *Age-specific fertility rate (ASFR) is the number of live births per 1,000 females in a specific age group. Five-year age groups were used in these tabulations (ranging from 15 to 19 years to 45 to 49 years). While the age specific fertility rate among teenagers aged 15 to 19 is decreasing, and births to teenage women account for a very small percentage of all births, health and social programs need to continue to be made available to address the special needs of teenage mothers. The trend in increasing maternal age also has far reaching repercussions for families and communities. This shift increases the likelihood that many adults will be caring for their children and their own parents during the same years. In addition, there are concerns regarding delayed childbearing and infertility.